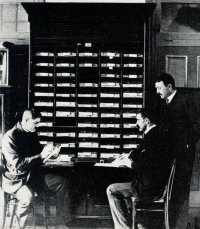 In April, 1902, Edmund Fosbery, Inspector-General of the New South Wales Police Force, appointed Sergeant 1st Class Walter Henry Childs to introduce the system of personal identification by fingerprints into his activities of the Police Department. The text book ‘The Classification and Uses of Fingerprints’ written by Sir Edward Henry, Bart., K. C. B., G. C. V. O., C. S. I., a former Police Commissioner of Scotland Yard, London, was the basis for the new innovation. Sir Edward was the first to classify fingerprints according to loops, arches, whorls, and composites and his system is now used by every major Police organisation in the world. Early in 1903 the newly inaugurated Fingerprint Section commenced operations with Sergeant Childs as Officer in Charge and Constable 1st Class J. A. Fowler as his assistant. Sergeant Childs remained with the section until 1915, when he was transferred to Albury as Superintendent in Charge of that district. He later became Commissioner of Police. The section was initially located in the front room of a small cottage in Phillip Street adjacent to the site of the old Police Headquarters. Fingerprint forms were then filed in a series of open pigeon-holes in a single filing unit composed of stiff brown cardboard with provision for 1,024 fingerprint forms. As the section expanded more suitable filing equipment became available. 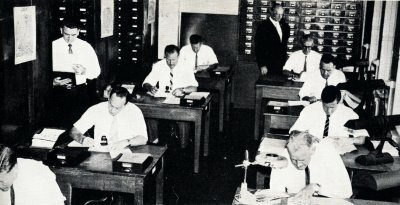 From these humble beginnings the section made marked progress through the years and on the 1st April, 1941, became the Central Fingerprint Bureau of Australia, incorporating fingerprint and criminal records for all Australian States and Territories of the Commonwealth. The Bureau was supplied with a motor vehicle and two panel vans for the use of the fingerprint experts called to the scene of various crimes to carry out examinations for latent impressions. These vans were specially fitted out for the carrying of exhibits and other technical equipment. In 1960 fingerprint experts travelled 58,038 miles, visiting the scene of 5,368 crimes from which 552 latent impressions were obtained and identified as those of the persons perpetrating the crime. Evidence of identification by fingerprints and palmprints has been long accepted in the various Criminal Courts and in 1959 a precedent was established in an Australian Court, when a footprint identification was successfully presented as evidence by an expert from the Central Fingerprint Bureau. Early in 1961 provision was made for portion of the palmprint, known as the Main Interdigital Area, to be imprinted on the rear portion of fingerprint forms. This new provision was intended to provide unlimited searching and filing data for future sectional experts. A survey taken on the 31st December, 1960, revealed that there were 686,622 persons recorded at the Central Fingerprint Bureau, resulting in the combined total of 1,043,456 master cards, alias cards, and recorded continuation cards being filed in the Central Card Index. Fingerprint and allied data were also regularly exchanged between the Central Fingerprint Bureau and other world Police organisations. A staff of 47 highly qualified fingerprint experts, 15 Police Cadets, and 25 female Public Service assistants, under the direct supervision of Inspector F. B. Whitehouse were employed in the Bureau in that era and were considered the nucleus of the unit.